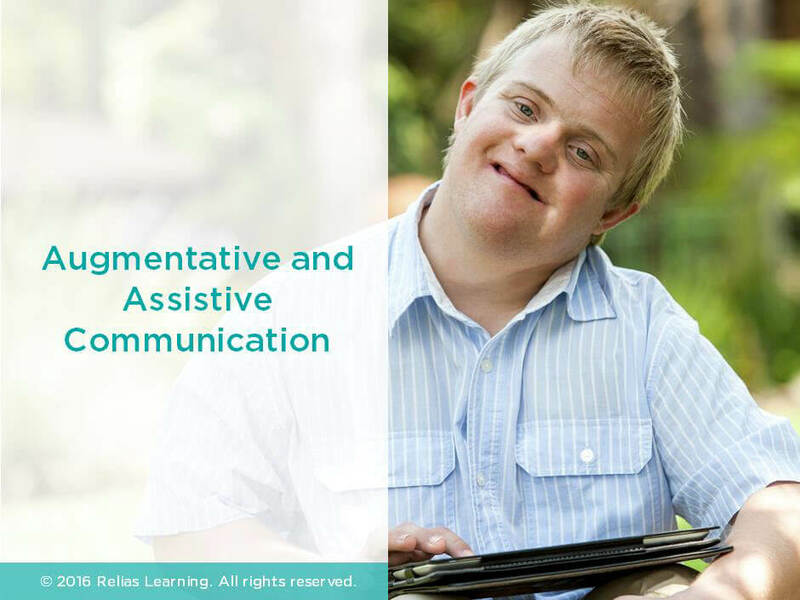 This course will explore the different types of augmentative and alternative communication (AAC) devices as well as the components of a comprehensive augmentative and alternative communication evaluation. By the end of this course, you will be able to confidently understand and discuss AAC evaluation and intervention. This course corresponds to Federal Regulations: F246. Disclosures: Amy Reinstein, M.S., CCC-SLP and Katrina Gilman, M.S., CCC-SLP have no relevant financial or nonfinancial relationships to disclose. Identify those who could benefit from augmentative communication. Describe two of the three main areas of language described by Bloom and Lahey. Provide one example that describes each of the three communicative functions described by Wetherby and Prizant. Explore three of the six necessary components of the AAC evaluation. Describe five types of symbol systems used with unaided and aided modes of AAC. Explain two different display and access options for AAC. Differentiate between low tech and high tech AAC devices. Amy Reinstein, M.S., CCC – SLP has been practicing speech language pathology for 8 years focusing on the dysphagia and neurogenic communication adult population. Amy has worked in various New York City acute care hospitals, skilled nursing facilities, short term rehabilitation centers, home health care, and outpatient private practice. She has extensive experience in performing and evaluating Modified Barium Swallow Studies. Her teaching experience includes supervising Clinical Fellows to attain their certification, as well as certified speech–language pathologists in home health and skilled nursing facilities. Amy has also worked extensively with the New York City Board of Education K- 12 and Special Education schools. Special projects include publishing various articles for trade magazines and blogs, contributing to CEU courses, publishing of a live website, and creating clinical assessments and evaluations. She is currently authoring a speech and language textbook and conducting a research study in dysphagia. Disclosure: Amy Reinstein, M.S., CCC – SLP has declared that no conflict of interest, Relevant Financial Relationship or Relevant Non-Financial Relationship exists. Katrina has been practicing speech language pathology for twelve years, focusing primarily on multiple disabilities and AAC. Katrina has worked in skilled nursing, sub-acute rehabilitation, and private practice, though her principal work has been in private educational settings for students with complex medical, educational, and behavioral needs. She has extensive experience in performing Augmentative and Assistive Communication (AAC) assessments, as well as obtaining funding for recommended AAC systems. Her teaching experience includes teaching undergraduate courses to students working to obtain their certification in Speech-Language Assisting. Disclosure: Katrina Gilman, MS, CCC-SLP has declared that no conflict of interest, Relevant Financial Relationship or Relevant Non-Financial Relationship exists. The target audience for this course is: entry level Speech and Language Pathologists; in the following settings: Post-Acute Care.